I had heard of this spot for years; read articles and seen TV segments about it, and emailed with its creator. As a deviled eggs master, it was my destiny to make a pilgrimage, and I finally did. 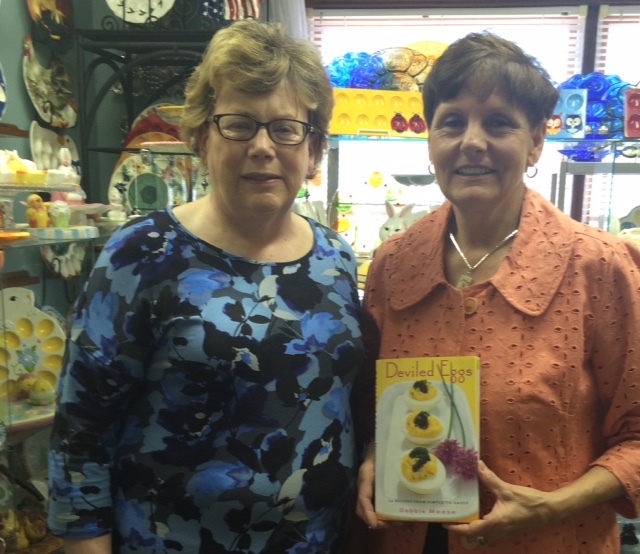 Marie Lawrence invited me into the deviled egg room – it’s floor to ceiling full of the servers. The latest count is 915. Marie is going for 1,000 and maybe a Guinness record. Like snowflakes, no two in her collection are exactly alike; she keeps a record book with descriptions, dates she acquired them and other information to make sure. room has barely enough open space for a chicken to make a nest. But it’s enough room for Marie to start the day with a smile, surrounded by color, enjoying her efforts. 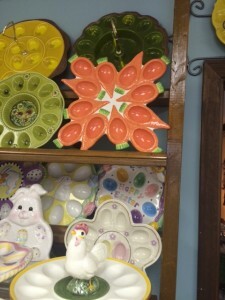 All those plates have to make you smile, with their hues, shapes, bunny faces and dancing chicks. A yellow one that a friend bought for Marie on a Disney cruise ship is shaped like Mickey’s face and ears. How appropriate, because this little place is like a Magic Kingdom. the left side and spots for just six eggs on the right. 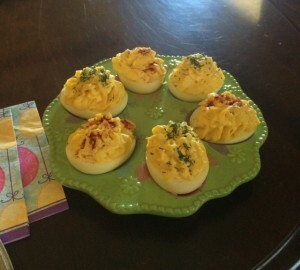 She thinks it was meant to also serve potato salad or egg salad with the deviled eggs. 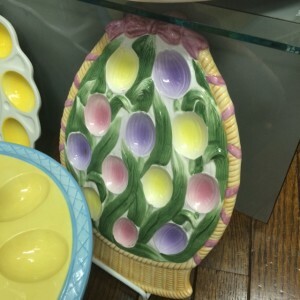 The newest in the collection, which a friend found at a Salvation Army thrift shop a couple of weeks ago, resembles a basket of tulips with 12 oval pink, purple and yellow sections for the eggs. Naturally, Easter, bunnies and chickens are predominant themes. There are a lot of Christmas ones, too, but even some with Thanksgiving and Irish looks. One of the largest is an Italian plate with spaces for deviled eggs and antipasto that could double as a centerpiece. The smallest looks like a covered ceramic bowl small enough to fit in your palm. Remove the lid, and there are spaces for two eggs – sort of like tea for two. There’s a plate shaped like an oak leaf with acorn salt-and-pepper shakers. One of my favorites is made up of bright orange carrots pointing in all directions. On the few occasions that Marie has exhibited the collection to the public, she says people have been attracted to one that looks like a violet-printed cloth draped in a basket. 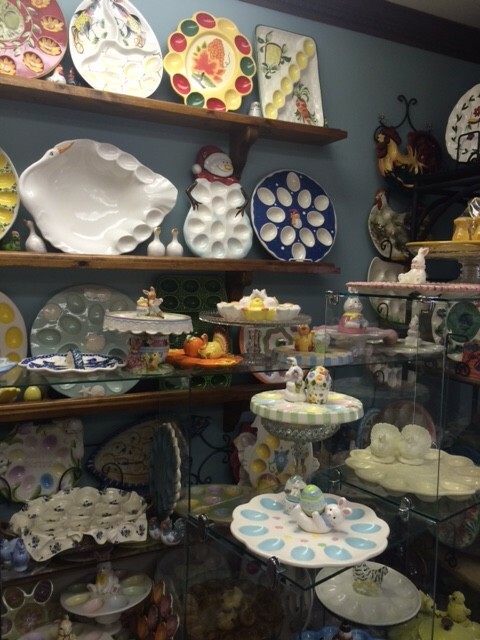 There are ceramic, pottery, glass and pewter plates. One with a wooden handle is shaped like a frying pan. I noticed that there were N.C. State and UNC plates, but no Duke one. Surely Blue Devils eat deviled eggs. “I haven’t seen any Duke plates,” Marie says. business. She was kind enough to have some for me to taste using mayonnaise (Hellmann’s not Duke’s; she prefers the flavor and texture), mustard, a dash of Texas Pete hot sauce and paprika or dill on top. I assumed that the super-creamy filling was made in a food processor, but Marie said she makes the filling using a collard chopper, which has a circle of razor-sharp teeth for prepping piles of greens. She does make an addition to her filling that I’m going to try. If she’s making two dozen deviled eggs, she cooks two more eggs and chops them all – whites and yolks – into the filling. It does make a substantial filling. Deviled egg plates…deviled egg cookbook….seems like there’s something we could come up with together. Stay tuned. A smart editor once told me: “If you’re going to steal, steal from the best.” That’s what I’m going to do today, from one of the best, Charlotte Observer food editor Kathleen Purvis. After reading her column today – which, as a food writer, I can say is absolutely true about the never-ending search for the new – I thought about how I recharge and what I would relive. Here are a few, with thanks to Kathi. – The first time I ate a soft-shell crab, which was the beginning of a lifelong affair. It looked like the inspiration for a ’50s drive-in movie, “Invasion of the Giant Crunchy Spiders.” I had to be persuaded that ALL of the crustacean was edible in this state. Oh, the little legs, how crispy; the center, how moist…. It was truly a new thing. – Driving around Normandy with The Hub. We armed ourselves with an extremely poor map, minimal French, a Swiss Army knife and a baguette from the corner baker, and set out from Bayeux for two things: cheese and Calvados, an apple brandy. We stopped at a roadside stand for the most sensually fragrant melon I’d ever experienced, then roamed, mostly lost, through the rolling hills that reminded me of Piedmont North Carolina, where I grew up. We found cheese and ate it with the knife while sitting on the trunk of the rental car, with the baguette and lovely melon. We ended the day tasting Calvados and its aperitif sister, Pommeau. – Walking through the backyard vegetable garden with my father when I was knee high, watching him pull two green onions from the red clay, brush them off on his pants leg, cut off the roots with a super-sharp pocket knife, and hand me one. We ate them on the spot, in the sun. Truly fresh vegetables don’t need a lot of messing with. The fun and popular Savor the South series by the University of North Carolina Press usually brings out two books in the spring, but this year, there’s a threefer: “Gumbo” by Dale Curry, “Shrimp” by Jay Pierce and “Catfish” by Paul and Angela Knipple. 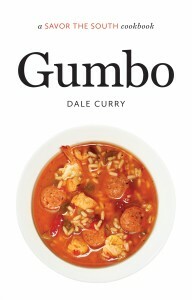 I have made gumbo as best as a non-Louisianan can, but the book offers regional takes that I never imagined. Catfish Gumbo or Quail Gumbo, anyone? There is a roux-less gumbo for those who find making roux challenging, as I once did. Curry’s directions for making roux, an essential part of traditional gumbo, are simple but useful. To tell the truth, it’s one of those things that you just have to do a few times and you eventually get it, like riding a bicycle or following knitting directions. But believe Curry when she says do not use a burned roux. 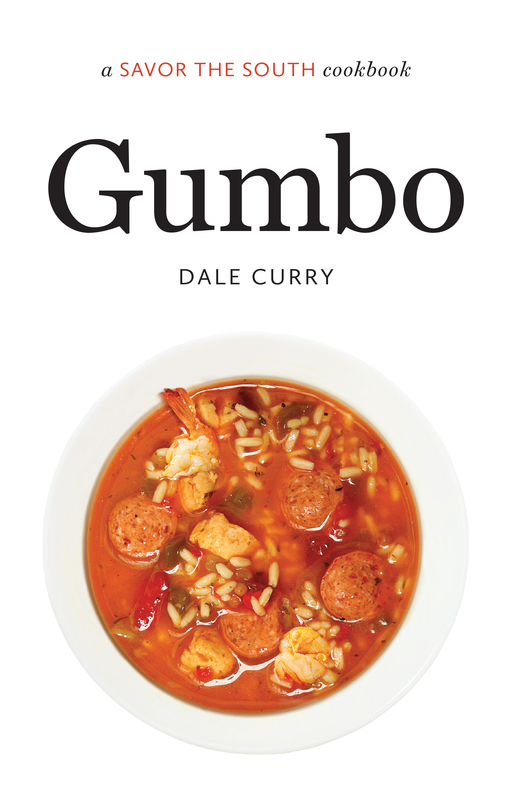 The book includes recipes for some of gumbo’s relations, such as jambalaya – including a recipe for a slow-cooker jambalaya that I’m looking forward to trying out. This is a book of classics from another area of the South that is a good addition to the series. 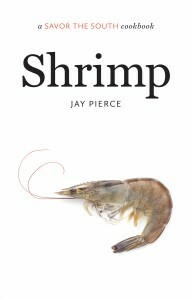 Pierce, author of “Shrimp,” recently became chef at ROCKSALT in Charlotte after years with Lucky 32 in Greensboro and Cary. (More full disclosure: I have met Pierce and welcomed him to the Savor the South sisterhood’s men’s auxiliary; he and Paul Knipple are the first men to enter the fold.) Whenever I encounter a chef-written cookbook, I get concerned that it will have miles-long directions involving hours of prep for those of us without a kitchen full of hired help. Not here. The recipes are creative and accessible, and the stories Pierce tells along with them make you feel like you’ve popped a beer and sat down next to a shrimp-loving buddy. How to select quality shrimp and freeze it offers great information, as well as reassurance that frozen shrimp is OK, depending on where it’s from. He also clearly explains why buying American-caught shrimp is so important. Soups, noodle dishes, pick-up goodies like Fire-Roasted Shrimp Tacos, rice dishes like Shrimp Risotto – there’s a lot of variety here. This is a great book to carry to the beach, or make you feel like you’re there. Catfish is a staple in the Deep South, but I wondered how the Knipples, experienced food writers who live in Memphis, would handle an entire book on the ingredient. On the surface, catfish seems limited to crispy fried plates at fish camps. But they show that catfish can play a role in unexpected places, including Vietnamese and Thai dishes. Coriander Catfish Rolls bring the ingredient to Asian spring rolls. It’s paired with Indian spices in Dodson Lake Samosas. And Delta Paella brings catfish to the Mediterranean classic. Catfish, I barely knew ye before now. 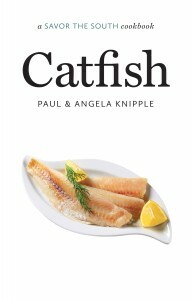 Of course, the book includes precise directions for producing perfect deep- fried catfish, and some traditional sides to go with it such as hushpuppies and slaw.